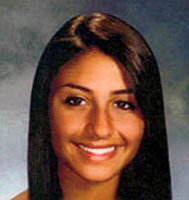 3:50 p.m., Nov. 2, 2011--Nicole Christine Marzano, 19, of Clark, N.J., died Sunday, Oct. 30, in a tragic car accident in Pennsylvania. Ms. Marzano was a freshman majoring in accounting at the University of Delaware, and she played on the women's soccer club sports team. “The University community is deeply saddened by the loss of one of its own. We extend our deepest condolences to Ms. Marzano’s family and friends and to the many new friends she made during her brief time here on our campus,” said Dawn Thompson, dean of students and associate vice president for student life. Elizabeth Melanson, a Ph.D. candidate in art history who taught Ms. Marzano's First Year Seminar this semester, said, "She was outgoing, friendly and a joy to have in class. She spoke with enthusiasm about her family, friends and soccer team, and seemed to really enjoy her time at the University of Delaware. Her classmates have told me that they looked up to Nicole and were always glad to see her in class and around campus. She will be dearly missed by everyone who had the pleasure of meeting her." Born in New Brunswick, N.J., she lived in Clark for 17 years. She was the salutatorian of the 2011 graduating class of Arthur L. Johnson High School in Clark, where she was a member of the National Honor Society, the Tri-M Music Honor Society and the Spanish Honor Society, which she served as president in her senior year. Ms. Marzano was a four year varsity member of the track and soccer teams and played basketball for two years. She was captain of the soccer team in her senior year. In addition, she was a peer leader, a peer mediator and a member of the Key Club for four years. She is survived by her parents, Vincent and Francine (Serrao) Marzano; her brother, Vincent J. Marzano; and her sister, Danielle L. Marzano, as well as grandparents Joseph and Florence Serrao of East Brunswick, N.J., and Stella Chapman of Rahway, N.J. She is also survived by many loving family members and friends. The funeral mass will be held at 10 a.m., Saturday, Nov. 5, at St. Helen's Roman Catholic Church, 1600 Rahway Ave., Westfield, N.J.. , and visiting hours will be held at St. Helen's Church from 4-8 p.m., Friday, Nov. 4. Entombment will be in St. Gertrude Cemetery, Colonia, N.J. In lieu of flowers, donations may be made in her memory to the Make-A-Wish Foundation, P.O. Box 4028, 1034 Salem Rd., Union, NJ 07083. Online condolences may be left at the Walter J. Johnson Funeral Home website.